Don't let your books gather dust. 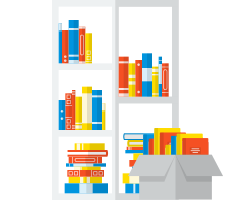 Shelf is an online library for organizations to keep track of their books and to create discussion around knowledge. You can add books to Shelf using their ISBN. Just write the number, search for it and you’re done. It’s really that easy. You can look for a specific book, knowing if the book has been borrowed by someone, so you can ask the current reader about it. After you're done reading your book you can review and rate it so that your colleagues know if it is worth reading it. If your organization loves books, Shelf will perfectly adapt to your size and needs. Want to discuss a custom plan that fits you better? Let's schedule a Skype call and talk about that!